Time to prepare your cannabis buds for smoking. 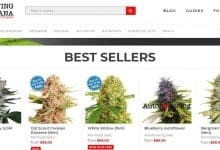 Best Method To Dry And Cure Marijuana: Preparing your marijuana for smoking is a two-part process that can take as long as two months, however, a good amount should be smokable within a couple of weeks. Be patient and don’t quick dry too much because if you have the patience, you will likely have the best weed you’ve ever smoked. 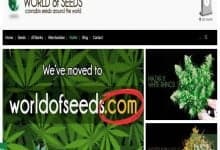 In a previous article, we showed you when the right time was to harvest and now its time to reap the rewards of all your hard work. 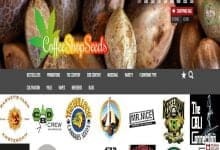 There are different methods to harvest the beloved cannabis plants. 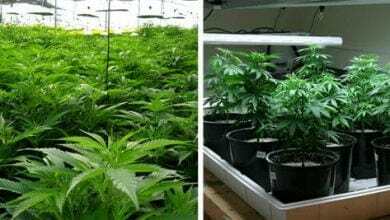 Which one is used depends greatly on the number of plants you have and their size. The most commonly used method is to trim the plant whilst it is still wet. The removal of the large leaves is important and should be done immediately after cutting off the main shoot to speed up the drying process. Leaves must always be removed together with stalks – otherwise, they may cause mold. First, the big leaves of the plants are removed. Cut the cannabis plant down on the main trunk and disassemble into its side branches. Now, one after another remove all medium-sized and not so resinous leaves on the branches with sharp scissors. Always cut off the leaves at the bottom of their stem, so that not a piece of stalk remains in the bud. 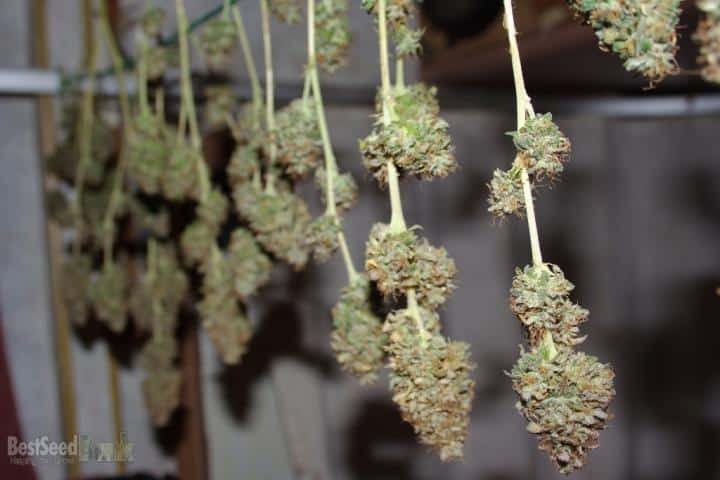 Hanging is the most common way to dry your buds. Hanging is the most common way to dry your buds. Take the long stems of trimmed marijuana and hang them from strings. The environment in which they are being dried is very important. Humidity should be low as high humidity will cause mold. If you notice mold forming on your pot (foul-smelling, fuzzy, very noticeable) don’t let it spread to other buds and reduce the humidity. String or twine can be twine can be used in the room, where the individual buds are hung. The buds should not touch, and there should be good ventilation. The plants now need 10-12 days to dry. This must also be done in the dark, as the plants will degrade the leaf green ( chlorophyll ) during this time , which significantly improves the taste and smell. During the slow drying, chlorophyll (leaf green) and other pigments evaporate and disappear in the plant tissue of the buds. If the flowers are dried too quickly, some of these pigments will not have enough time to leave the buds and will end up in the final product. Cannabis with a high content of chlorophyll often has a bitter, hay-like taste and smell. So there is no reason to speed things up. The drying phase is over when you can break the stems of the buds with a crack. If the buds are still too moist, the stems can only be bent. A fan (not aimed directly at the buds!) Additionally supports drying. The temperature should be relatively low, less than 70 degrees. High heat and humidity will cause mold and actually decrease potency. Let the buds dry for a few weeks, or until they are dry. A good way to tell when the buds are dry is that the stems will snap instead of bending. Every day, look for mold and mildew and remove all buds that have rotted. In the first three days, the relative humidity should be about 50%. After three days, it can be increased again up to 60%, so that the drying process slows down. Good air circulation is also recommended. You can do this with a fan or a ventilation system. If you have something with which you can control the temperature, that would be ideal. Just make sure you do not put the fan on the buds so they do not dry too fast. Once your buds are dry, they will be mostly smokable. 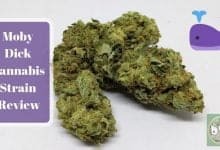 Most of the smaller buds will be ready to be rolled into joints or smoked in a bowl, but you should still cure your buds. 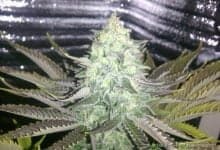 The curing process is a very passive process that is not particularly hard to stick to because the weed is generally pretty smokable while you are waiting for the optimal cured product. 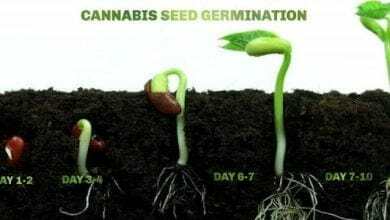 The idea of the curing process is that there is still some water in the buds that can come out. 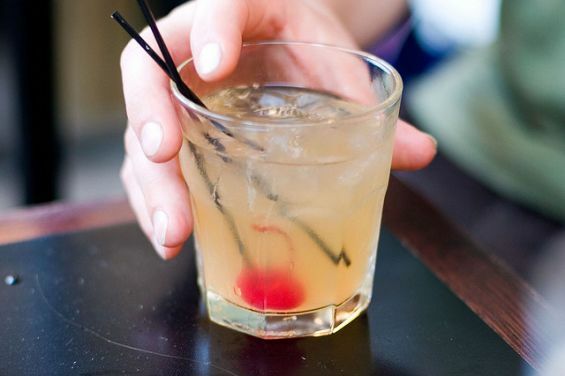 It is also a process to balance the water inside and out with the buds. You should save your buds in glasses with a loose lid. Every day you should check if there is mold and mildew. 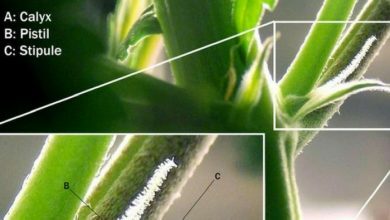 You will notice how more moisture comes out of your buds. They are ready when they are exactly what you want them to be. 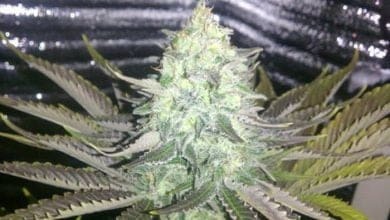 Some breeders will harden their buds for a long time to get a very good quality. It’s like a glaze on the cake because it’s the last step to an extremely good smoke! 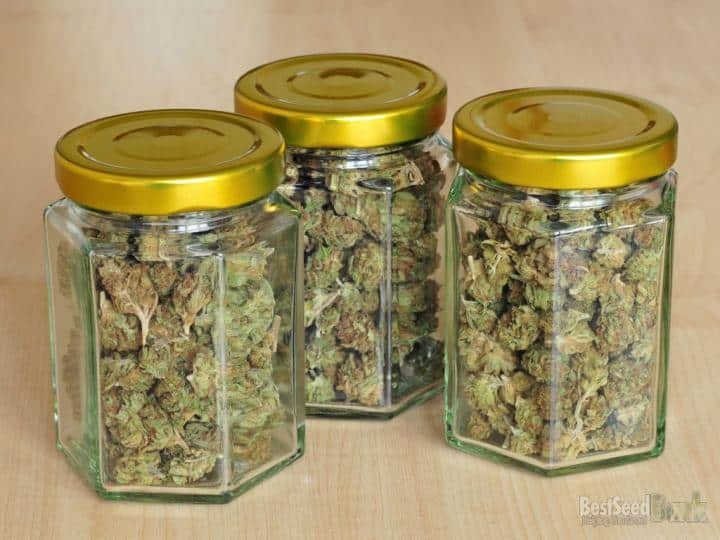 To cure the buds, simply remove as much of the stems as possible and pack the buds lightly into mason jars with lids. Open the lids once or twice a day to let excess moisture escape and continue this process for about a month. After you stop seeing moisture forming on the inside of the jar, you have officially grown your own marijuana. The buds are then ready for long-time storage. Sit back, and smoke your marijuana. Also, see our additional reading section. 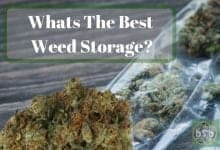 When you harvest your weed, you may be overcome with excitement to smoke some right away. 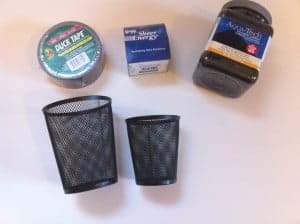 While these quick-drying techniques will make your weed smokable, take a few weeks to properly dry and cure the vast majority of your buds. 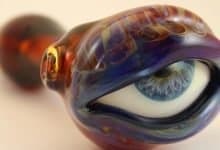 Use these techniques only on small amounts to smoke right away. Smoke from quickly dried marijuana is harsher and less potent. Place your buds on a glass plate. Place the plate in the microwave. To avoid burning, make sure the microwave is set on low (about 30% power, microwaves may vary). Turn on for 10-15 seconds at a time. Pull out and check buds, then rotate them. Do this several times until the weed looks smokable. Place the buds on a cookie sheet and put in the oven at around 120 degrees. Bake for about 10 minutes. Pull out and allow to cool, rotate and repeat. Place your buds inside an envelope and put the envelope on some heat source. Radiators, old tv’s and other heat sources work great. This method can take a couple hours but will be marginally better than the above methods. Enjoy a bowl, but don’t quick-dry your whole harvest. Properly dried and cured marijuana has much better flavor, smell, potency, and smoothness. Would dig an article on dealing with labor!